Every year new interior design decorating trends pop up and further prove the existence of forward-thinking design choices that are surprisingly offering much in the way of aesthetic appeal. The following are just a few of these current interior decorating trends that are making their way through our homes. Black is definitely taking over the interior design world, and this includes incorporating black walls or black ceilings into your design. They create a powerful, yet elegant, statement and unlike previous misconceptions; black does not make the room appear smaller. However, it is also suggested that you pair the black with other lighter colors for some contrast and to enhance the appeal of the black. Another design trend is taking nature and bringing it indoors. Warm and more natural elements are being added into designs to make spaces look and feel more authentic and real. Natural wood elements alongside granite, marble, or pebble material are suitable. Statement ceilings and floors are another design trend, and these statements include bold colors and patterns that can make a statement about the space without going overboard with all of your interior design choices. No matter which design trend you are looking at, the biggest and always prevalent trend is going to be personalization. You want to really own your space and to do this; you need to put your own personal touch on it. Don’t be afraid to incorporate elements that speak to your own personality and show off charm and character. 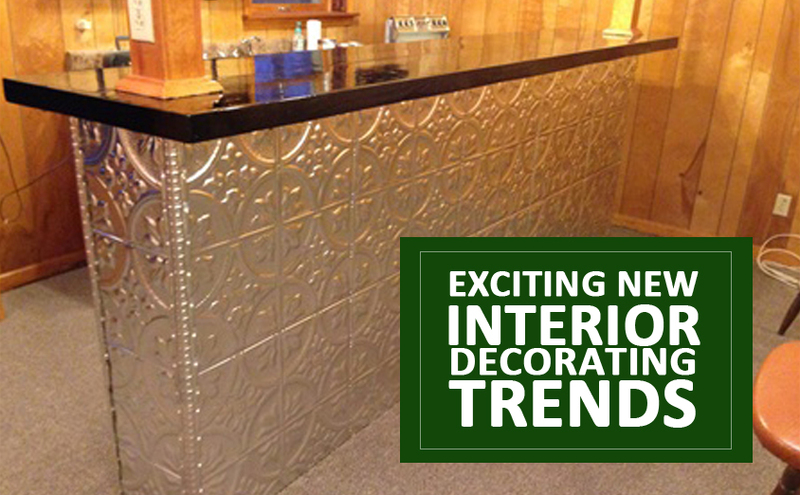 Metal tiles are a great avenue to take when you are looking for an inexpensive and easy way to transform the space while being able to take advantage of these current interior design trends. Since they come in a multitude of different colors, styles, finishes, textures, and designs; you will be able to achieve any of these design ideas easily and effectively without the madness and complexity of a huge reno project. What are Nail-up Tin Tiles? Copyright © 2019 Metal Ceiling Express. All Rights Reserved.